Truly. I find it a good thing that I haven’t posted a blog in so long. It means that I’m busy living life! But all of the wonderful people back home do deserve an update on the latest that’s been happening in these past… five months. Whoops. Let’s see, the most important thing to know is that I continue to learn that God’s plan is not my own. My last blog post, I talked about how excited I was to start teaching high school English at the bilingual Catholic school down here. Yeah. That didn’t happen. There was this and there was that; something fell out of place here and into place there. 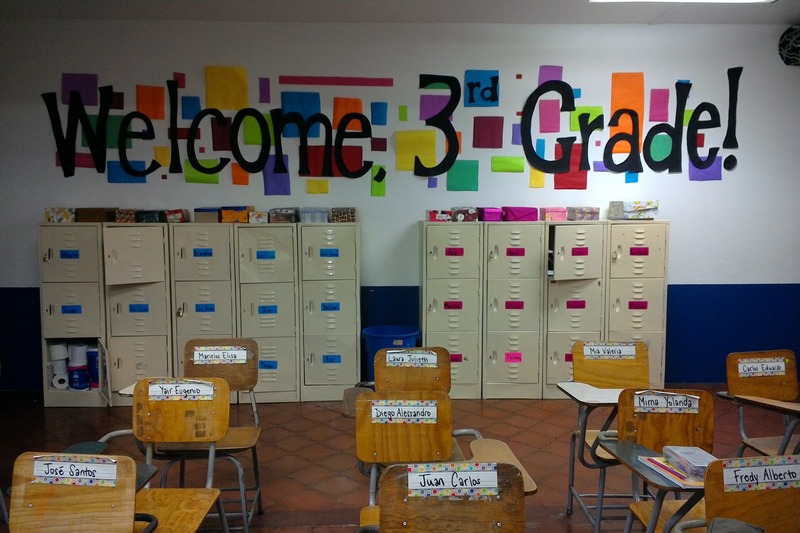 All of a sudden, I’m teaching 3rd grade math and science at a different bilingual school in Comayagua. Yes, that’s a locker full of toilet paper down on the left. I know. Math and Science. It’s okay. You can laugh. I laugh about it too. My kids are great, though, and in my own efforts to make rounding and units of measurement more exciting for myself, it hopefully makes it more exciting for them too. We sing a lot. The boys keep asking if we can make something explode. We’ll see if I can find Mentos here in Honduras. Also hilarious in a sad sort of way—even living out of the mission house I still have to get up at 5am! 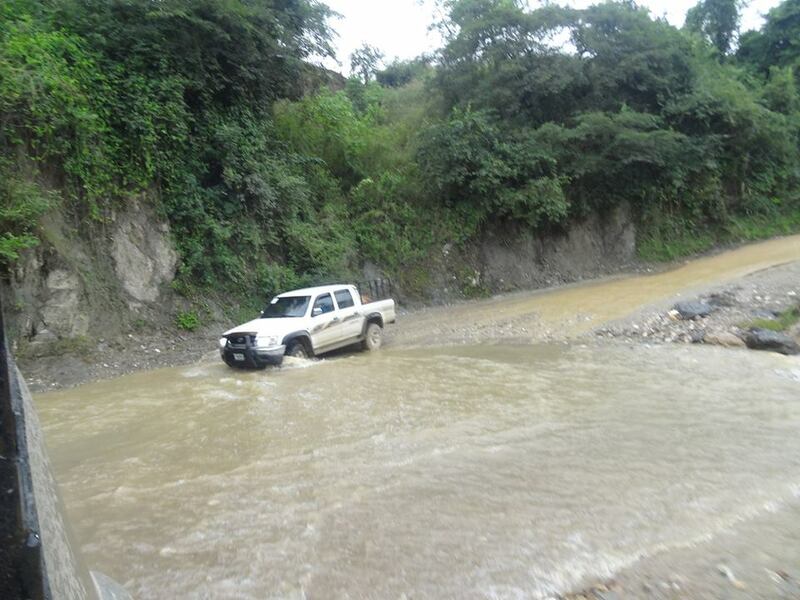 Hondurans start their days early! Right! So I’m not in the mission house anymore. That’s been a huge transition. I’m living in the city of Comayagua with two sisters (not like nun sisters, just regular blood sisters) who are both studying in university. I’m also with Ashley, my fellow missionary who likewise just finished her two year commitment. She spends her days volunteering at San Benito, the Friar’s medical clinic, and hanging out with the Missionaries of Charity. Her plan is to head back home in December. As far as my own plans. See the above. I have no idea. Or rather, I think my problem is that I have too many ideas. Ideas for if I go home, ideas for if I stay. Just waiting to see which ideas play out and in the meantime, I’m enjoying this next chapter of life. Ashley and I talk about it all the time, how much confirmation we both feel like we’ve received in our decision to stay longer. One of my most powerful moments was at a Pan de Vida retreat last weekend. Two teenage girls from Casa Misericordia came. I basically spent the entire weekend hanging out with them and loving it. We ate our meals together, sang the songs together, sat on the cement floor together. I think one of the most important part of being a missionary is being there for life’s ordinary moments. Yes, the big ones too, the times of crisis and celebration, but it’s mainly loving people in the day in and day out. I’m looking forward to doing more of that this year. Goal: To update this blog more regularly on the regular moments of life. Maybe it won’t be as exciting, but life is beautiful in its simplicity. One regular(ish) life moment: Yesterday was Independence Day in Honduras (in Guatemala, Costa Rica, Nicaragua, and El Salvador too). Celebrated by marching in the parade. All of the teachers from the school had to. It was… long. And hot. But I feel a little more Honduran for having had the experience. After spending the afternoon napping, that night we saw an orchestra concert and fireworks in the central park. Overall, an excellent day. Photo courtesy of Gracia’s facebook page. Thanks, Gracia! As most of you are probably aware, the end of my two year commitment to the Missioners is rapidly approaching. Only three months away, in fact. As such, I’ve had to start looking toward the future and thought I should officially tell all my family and friends what my plans are. Long story short: well, I’m not quite ready to leave yet. Two years in and I finally (mostly) speak the language. I know the kids and their stories. I have relationships and friendships. 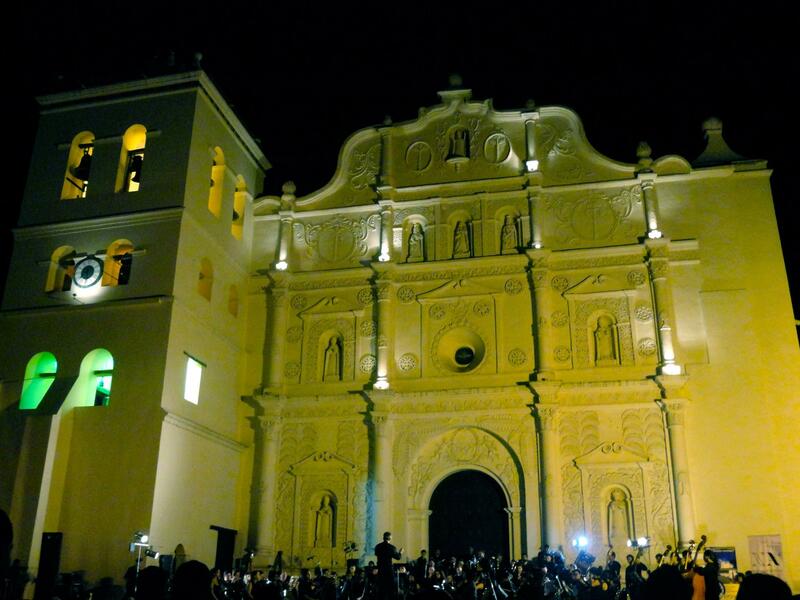 I love Comayagua for both its beauty and its sorrows. Our community is my second family. So I prayed a lot. Cried a little. Talked with my mom and one of the Poor Clare sisters. 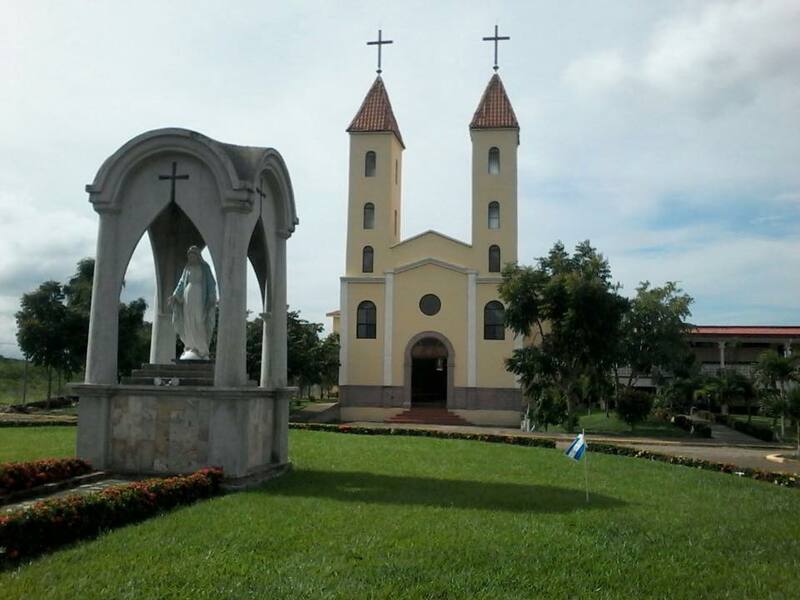 In February, I met with the Board of Directors of Comayagua’s Catholic bilingual school, Our Lady, Queen of Peace. Last Friday, I met the principal and got the tour of the school. This week I started taking steps to renew my residency. It’s everything I love in one place: God. Books. Honduras. High Schoolers. I’m super excited. It’s funny how for so long, I had so much anxiety about what the next steps would be, and then, everything just naturally fell into place. I have no idea if this will last beyond a year, but for now, at least, I’m very much at peace knowing that I’ve been given enough light to see the next step. It’s also really wonderful to not be saying goodbye. I’ve spent most of my life leaving people… always moving, transferring schools and jobs. It feels so good to decide to stay. To not have to start over again, but to continue deeping. That’s definitely what I’m most excited about. I love the mission life, but we never really stop moving. One day in this ministry, the next day in that ministry, one week in this aldea, the next week in that aldea. The consistency of seeing the same kids every day is going to be phenomenal. Oh! But that’s a key point too! Even though in August I’ll be moving out of the house and into the teacher’s apartments, I’ll definitely keep working with the Missioners. We still have a lot of details to work out with regards to what that will look like, but I image I’d continue to help out with Becas on Saturday mornings, to volunteer for the Pan de Vida retreats, things like that. We’ll see. It’ll be a big transition, but one that I’m looking forward to. In the meantime, there’s plenty to keep me busy until August. My goal is to make the most of these last few months living in the house. 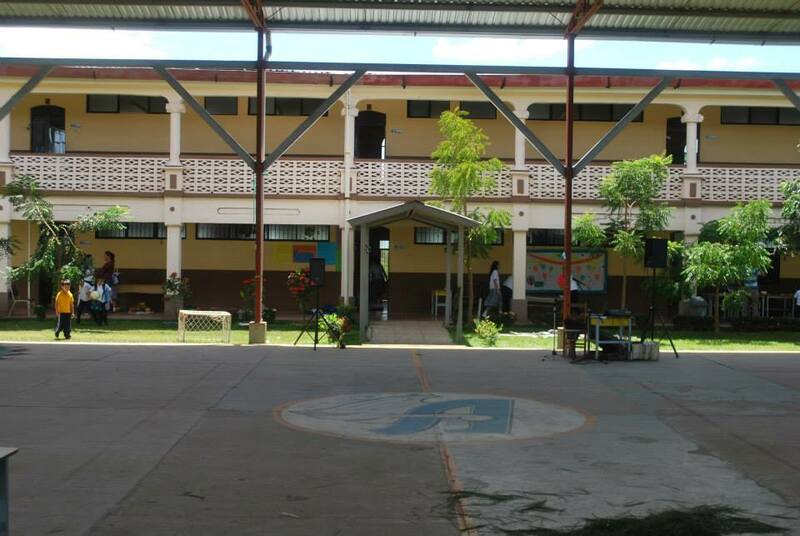 And before I sign off, here are some pictures of the school. The first picture is the chapel (which you can actually see from our house and Casa Guadalupe) and then the second picture is… sort of the front of the school and its classrooms. They don’t have an official website, but the link above is to their Facebook page if you want to see more. Beautiful, right?? See, the first aldea I was in didn’t have any running water, only a spring; the second, the pipes had broken, so there was no water; and the third, thankfully, did. From there I would move into how incredible the strength of the people is… and man’s will to survive. I think that’s one of the things that I love most about being down here. You come to know a little more about your own strength. Yes, you may be exhausted and don’t think you can take another step up that mountain, or wayyyyy to full to take one more bite of beans, or so cold that you have no idea how you’re going to fall asleep…but the hardships remind you that you’re alive. And then you conquer them. And there’s an exhilaration that comes with discovering a strength within yourself that you didn’t know you had. One of the other things I love most about being down here… the interactions that I have with people. How phenomenal it is to sit down to dinner without the distractions of phones and television and talk to one another. To hear stories about each other’s lives, to philosophize over the big and the little things… whether’s questions about the dignity of the human person or whether the chicken or the egg came first. To share in those sufferings, but also in those triumphs and the laughs. To visit someone, and have the door opened to you. Graciously. To have someone take the time out of their day to listen to you. To sacrifice the little bit of money that they have to buy you bread. To share openly with strangers. To hug sincerely. To be loved, not for what you’ve said or done, but simply because you’re there, present before someone. And it’s so humbling. Because they would have loved whoever had come through that door. It just happened to be me. And it’s so humbling… Whether it’s the woman who’s been sick for thirty years, or the man who’s lost his legs, or the woman who’s son died three months ago… to enter into their homes and share the message of Christ’s passion. Who am I to talk them about suffering? But that’s just it. This isn’t about me. It’s so much bigger than me. It’s a universal message of God’s love for all of us. This would be the next part of my water theme: how even more than water, that’s so essential for our daily needs of cooking and cleaning, man needs the living water. Man needs Christ. We need the message of His hope, His love, the message of His cross, the message of His resurrection. It’s the only way to make sense out of both the evil and the joy that we encounter in our world. And again, down here, the joy and the sorrow are so much more defined; you can’t escape or ignore either. Then from there I’d move on to the last part of my theme, the part that’s the most amazing of them all. It’s obvious that man will thirst for water, both the physical and the living kind, but we have a God who thirsts for us. He longs for us. For our love. And yes, He’s God and complete without it, but that’s what makes it all the more amazing. He doesn’t need us– our love, our prayers, our actions… And yet, He desires us. Two of the aldeas I was in this past month have Mass four times a year. Four times. If I was writing this as a for real paper, I’d have a lovely conclusion here that tied this stream of conciousness together (which I would have edited), but since it’s my blog… I’m just going to end by saying thank you to all those who came down for Spring Break. Especially those on the three incredible teams that I had… Tito, Gian, Rachel, and Carly; Isaac, Peter, Mariana, and Rio; Jacob, Kesley, and Hannah. Thank you for saying yes and for answering in this small way, Christ’s cry on the cross. Keep us in your prayers! Question—have you ever been school supply shopping for 40 kids the week before school starts? As someone who has, let me tell you… it’s not actually as crazy as it might sound. But it was still pretty crazy. There’s really a lot of back story here that I should tell you about the Honduran school year, our scholarship program , etc. but really, I just want to tell you about Miguel, his sister Digna, and his brother José. Three weeks ago, one of our extended Honduran missionaries, Cesar, was waiting for me after Mass. He wanted to ask if we’d be able to help a family who lives in his aldea. The three youngest kids would be going to school this year and they didn’t have any shoes to wear. Cesar was telling me how he’d been able to get a nice pair of sandals for the oldest boy (who’s about 14 years old) a few weeks back, but the next time he saw the boy, he didn’t have them anymore. When Cesar questioned him as to where the shoes were… the boy had given them to his mom. My heart was pretty much broken right then and there. That said, we can’t just give things out to everyone who comes to our door. One, there’s too much need, and two, that can create a dangerous dependency. That’s why our scholarship program places a minimal emphasis on the actual supplies that we give the kids. That’s really the smallest part. The real work is in the daily after school tutoring, the Saturday morning service projects, and the mother’s group that we have. The goal is to transform the families by forming real relationships with the children and offering a more authentic support to the mothers. All of this is based upon the dependency that all of us, Hondurans, gringos, rich and poor alike, have on Christ. My point is, before we could just give out shoes to this family, we needed to know them and their situation a little more. As such, two weeks ago, Katy, Cesar, and I made a visit to the family’s house. Like most Honduran children, they were ridiculously cute, pretty shy, but incredibly sweet. That was what I walked away from the visit with. I’m a teacher. I’m all about the interactions with the kids. Katy on the other hand, is studying to be a social worker. She’s seen a wide variety of poverty and is literally in training on how to assess it. When we left she had decided that we wouldn’t just give the family shoes, but all of the other supplies that we normally give to our kids in Becas (which means scholarship, in case you were wondering). These kids, because they live farther away, wouldn’t be able to participate in our program, but Cesar has been working with the family for a while and is going to do regular follow-ups when he’s home on weekends from the university (he’s getting his degree in Psychology). Because of people’s schedules we were WAYYYYYYYY super behind on our school supply shopping. Wednesday morning we collected all of the sizes from all of the thirty-six kids in our program. 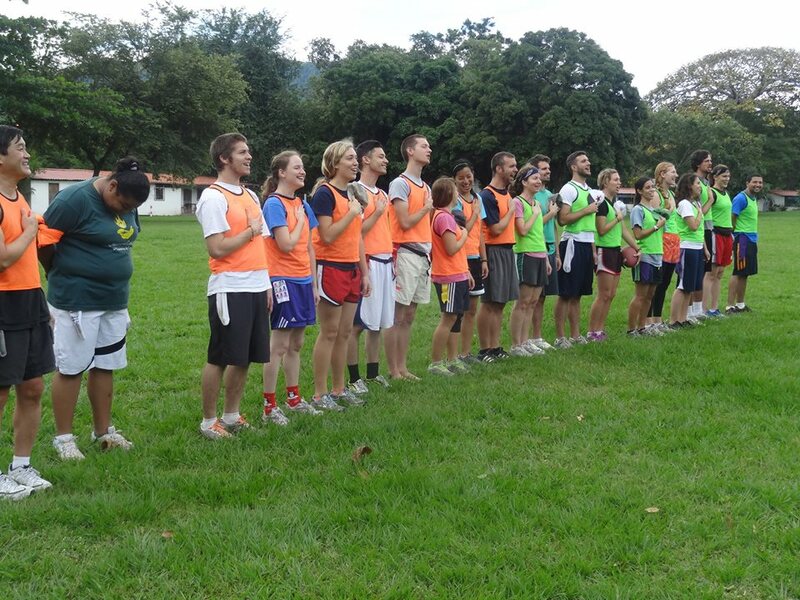 FYI: All the public school kids in the country of Honduras have the same uniform. White button down shirt, blue skirt for the girls, blue slacks for the boys, and black shoes. For the shirts and pants and skirts the sizing wasn’t so hard… it’s fairly easy to judge which kid is a 6, an 8, a 10, etc. and they have a pretty good idea themselves. But the shoes! Hahaha, so no one knew their shoe sizes and we had to trace most of the kids’ feet out on sheets of paper. Then that afternoon, we ran downtown to do some intense shopping. Actually, that’s one of the really nice parts about shopping down here. You tell the workers what you need, and they get it all together for you. So those poor workers at the shoe store… we handed them our twenty pairs of cut out feet and then waited for… well, a really long time, while they went upstairs to their gigantic supply of shoes and found matches. As this was taking forever, Karen and I (have I talked about Karen before? I must have… about my age, works for us doing all the day-to-day work in Becas, one of my favorite people ever) went down to the giant department store like place to start buying the uniforms. I also felt bad for the fifteen-year-old boy helping us. I mean… this place… it’s not like a Target where you go in, and here are all the shirts hanging up or folded by size… it’s more like… here are the socks, in bags from the floor to the ceiling. Not even kidding. Good luck finding the sizes you need. Or here the skirts and undershirts which have all just been thrown together in an enormous pile and you have to dig to find the ten size 8s and the four size 12s and the whatever else it is you might need. Ha, that was funny too, when we realized the skirts were not actually labeled by 6, 8, 10, etc. but by 30, 32, 34, etc. Thankfully, between Karen and myself we did a great job guessing the sizes of the skirts for the girls. When we passed all of this out on Saturday morning, everybody’s fit! Or close enough that with a small stitch you won’t be able to tell the difference. So yes, after spending alllllll of Thursday then at the mall in Tegucigalpa buying the thirty-five backpacks and the ninety notebooks and the sixteen compasses and eight dictionaries and goodness knows what else, we packed everything up for the kids in their backpacks and were done that same night! We actually spent our Friday day of silence, well, in silence. It was truly miraculous. Anyways. Saturday morning comes, and we’d told all the families to be there at 8am to receive their supplies, try on their uniforms, etc. Well, walking back from the Poor Clares at 7:30, I see the aldea family walking up! To be fair, they were on the bus schedule. So I take them to our library and pull out the kids’ backpacks so we can start trying on their uniforms. I can’t even tell you how big their eyes where when they saw their backpacks. It was like Christmas. But José’s shoes were too small, and poor, sweet Miguel. Oh, to complete this picture, you need to imagine Miguel in this little red hat winter cap with earflaps. He’s going into kindergarten and I guessed his size based on the smallest kid we have in the Becas, who was getting a size 6 of everything. Miguel, turns out, is smaller still. The pants went up to his chin. So cute. But clearly not practical. We had a few other misfits too, so that afternoon we went out again to make the exchanges and then drove back out to the family’s house to drop off the shoes and uniform. When we pulled up to the house, we very much caught them in the moment… One of the boys is sitting in the doorway, looking at the first grade reading book, the little girl, Digna, is still wearing the pink backpack that we gave here, and the notebooks and pencils and all of the other supplies that we had given them completely covered the one bed that they have. When we came in, Miguel couldn’t stop giggling. He was so excited about his new shirt and his pants… which, even though they were the smallest size that they make, were still a smidge big. I think he’s my new favorite kid. Before we left I told them I’d be asking Cesar for updates on their grades, and hopefully, I’ll be able to go back and visit now and then. They’re not too far away from the seminary (where classes start again on Thursday! Hooray!). Anyways! We’re currently updating our Becas’ website but we have ten new kids this year who need sponsors!! Think about it, pray about it, and let me know! So for those of you who’ve been with me for this entire year, you might remember that last year I had a small Christmas wishlist. Last year, I was much more on top of my game and posted mid-December instead of, well, the day after Christmas. So, we’ll see what sort of response there is. hmmm…and that’s about it. Honestly, what we need most right now are donors to support our scholarship kids and university students. A new school year is starting in February and it’d be great if we could have it all lined up and ready to go. I’ll probably do a post when I get back down with pictures of the kids and stories and why you should sponsor them. If you really want to know, we need a new truck, (well, a used Ford Land Cruiser would be ideal but I realize that’s a stretch) so if anyone is feeling SUPER generous this holiday season, lemme know. Oh! And rosaries! Even the plastic ones! We always need more! As far as getting all of this to me… well, if we’re friends in real life, hopefully you’ll be seeing me soon! I’m hanging out at home until Jan. 7th and doing a NOVA trip. around the 4th/5th ish. Also, you can Facebook or email me for my address! Last but not least, as always, what we need most are prayers. 2014 was a rough year… hopefully 2015 will be a little… less rough. Muchas gracias! Que Dios les bendiga!! Merry Christmas, everyone! Hope everyone has had a happy and blessed holiday. In the spirit of the season… here’s my post about Thanksgiving! It’s funny how sometimes it’s by going away that you realize just how much you belong where you are. 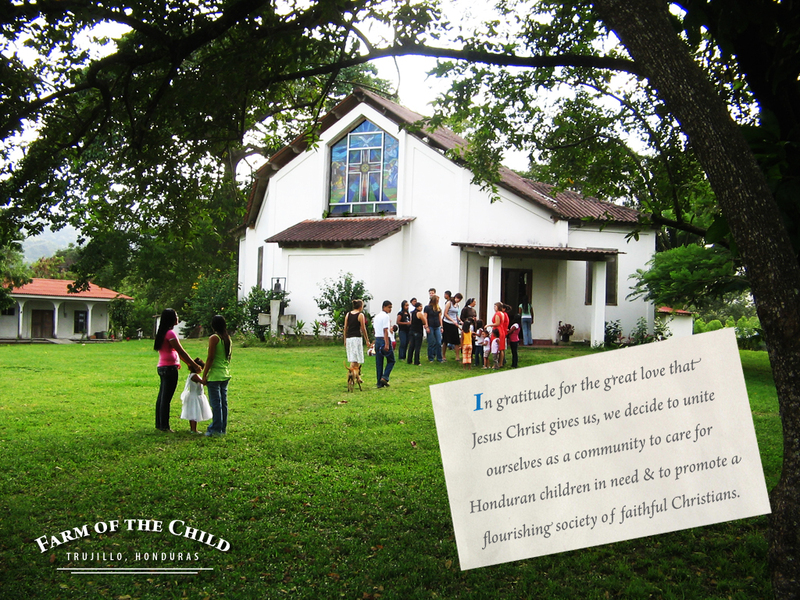 For Thanksgiving, as previously mentioned, we went up to Farm of the Child in Trujillo, Honduras. The chapel at the Finca. As you can see from the photo I stole from their website, it’s gorgeous up there! The orphanage and school are on the shoreline and I’m fascinated by the methodology: the kids all live with “aunts” or “uncles” in a home setting based upon their ages. The whole place was incredibly peaceful. Plus, we had so much fun with the missionaries who live there! Wednesday night we had a talent show, Thursday morning played flag football, and after exploring a little of downtown Trujillo that afternoon, came back to a ridiculously delicious Thanksgiving meal with their local community. I think the best part was just sharing the ups and downs of mission life with those from the Farm. 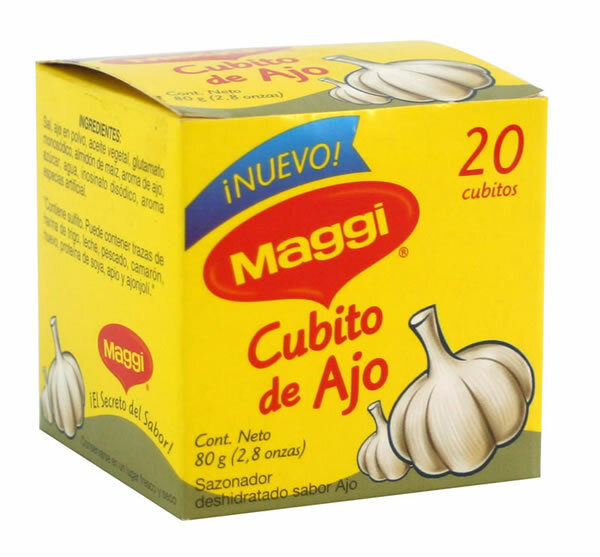 Tough questions like managing different personalities in community but also the silly ones too, like why do you throw a cubito in anything and everything that you cook? Yo no sé. Coming back was quite the adventure as well. Thanks to rain, pretty much all of the bridges had washed out, so we had to take a different route back and the truck broke down in the middle of NOWHERE and ya, know, the usual. We were giddy with relief and exhaustion when we finally made it back home. Honestly, home had never felt so much like home. I think that’s the way all trips should be…. you enjoy the vacation, the going away and seeing new places, but you’re happy to back. Of course, coming back meant jumping into the chaos of our training week! When we got back, we only had three more days to finish all of the preparations for the 25 teenagers that were coming… but that’ll be a later post. haha, so remember when a month ago I posted the picture with the hopes that I’d have a new blog posted the next week? I don’t even know why I pretend anymore. But! I’ve made it home for Christmas… and well.. still actually don’t have a lot of time for blogging. Between Krispy Kreme with friends, puzzles and Frozen Free Fall with the family, and all the usual eating and sleeping whatnot, there hasn’t been a whole lot of free time. Still though, there are too many beautiful stories not to post, so my goal is to do a quick summary of my life since November in a series of shorter posts these next few days (ha, but no promises). The day before the picture was taken had been an especially busy Saturday… I don’t remember with what, but I remember it was about 4:00 and all I wanted to do was shower and rest before the 5:00 Holy Hour. I was literally on my way, like walking to my room, when the car honked and so I opened the door to let in the guys returning from the boys orphanage. Justin jumps out and asks if I want to go with a few others to visit a family who was finishing the 40 days of prayer for a family member who had died. It was one of those things where, I didn’t want to, but I knew that I should. After all, I knew the family and a person only dies once. So I went along. Of course, it was a lovely visit. We talked mostly about food and Christmas decorations, but we prayed together and cried together and it was good. I was glad I had gone. The next day was the Feast of Christ the King and First Communion and the celebration of the delegates (those who lead the Liturgy of the Word in communities where there’s no Mass). Despite showing up quite early to Mass at the parish, the church was OVERFLOWING. Seriously, there was a huge crowd of people who couldn’t make it in. Sometimes being as small as I am is quite convenient. 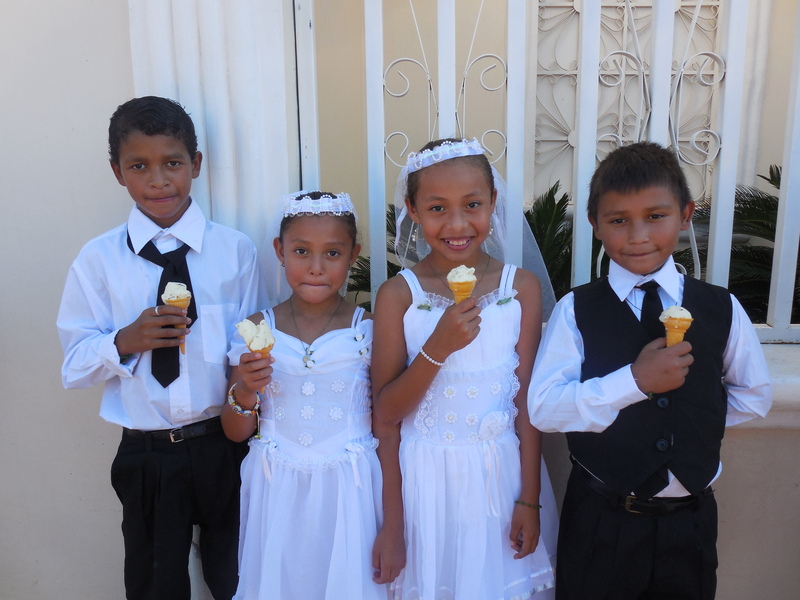 We needed to take pictures of our scholarship kids who were making their First Communion and, thankfully, I was able to slide into the very back of the church. In the last row of chairs, right in front of me, were all of the girls from Casa Misericordia! Hooray! So I’m giving all them hugs when, low and behold, in the row in front of them is the family we had visited yesterday! The mom waved me over, and I wound up getting a seat and holding her super cute five-year-old daughter! It’s funny how good deeds sometimes repay themselves in unexpected ways. It’s hard to put into words how I felt during Mass… but more than anything else, was just this sense of belonging… a sense of community and family. Between the Casa Misericordia girls, the girls’ orphanage girls, the scholarship kids, the moms, our neighbors… I knew a sizable number of the people in the crowd. And not only do I know them, but with a fair number, I have genuine, authentic relationships… which was basically my motive for coming down to Honduras in the first place. It’s pretty surreal to see that goal being… realized. Also something to make you feel good about life: understanding the jokes Father’s making. Win. Next blogpost: Thanksgiving Adventures! And a very BLACK Friday. I’ll post the official blog… maybe Friday? But here’s the preview. Love my life. As you may or may not have seen on the news, Miss Honduras and her sister were murdered last week. If you did hear the story or read the articles, you probably also were reminded that Honduras is one of the world’s most dangerous countries, has the highest homicide rate in the world, even the Peace Corps has left, etc. etc. And… what can I say to all that? When friends and relatives worry? Because it’s all true. The police have regular checks on the highways, Coke trucks have armed guards, you can’t go out a night…. a few weeks ago, a man I knew, the uncle of one of my friends, was murdered. One of the Hondurans was asking me about it. What was my perspective? Did I feel safe? Would I ever leave out of a concern for safety? While I can’t answer for forever, I can say that, for today at least, my feelings are pretty much the exact opposite. Yesterday was our final English class at the seminary. We had had the exam last week so that this week we could have a party, complete with popcorn, cookies, and a movie (in English, obvs… and I have to say, I enjoyed Guardians of the Galaxy so much more in English than I did in Spanish). Afterwards they were really sweet and offered their thanks for my work, but I was more excited because it gave me an opportunity to thank them. It’s one thing to hear the statistics… how there’s one priest for every seventy mountain villages, but this year has allowed me to see much more closely the monumental tasks that these men take on. There are so many people. Two weeks ago for the confirmation retreats we held in Santa Elena, the church was filled with at least 500 people made up of the youth, their parents, and their sponsers. That’s just one little sector. There are so many people… and they’re a people that has been deeply wounded by poverty, violence, abuse, and abandonment. Yet it’s where the suffering is greatest that His love and healing is needed most. And these young men have said yes. That they’re willing to spend the rest of their lives in service, tending Christ’s flock. Pouring themselves out for each and every one of the Church’s members. It’s nothing short of heroic. Last weekend was the final retreat for a group of teens in San Luis. We started the monthly formation in February and it’s been one of the most challenging and humbling experiences of my year, but also one of the best. Seeing the same youth every month, eating so many meals around Father’s small dining room table allowed for relationships much deeper than the ones we can form in just the week long mountain missions. He was absolutely helpless. He could go nowhere but where she chose to take Him; He could not sepak; her breathing was His breath; His heart beat in the beating of her heart. During this tender time of Advent we must carry Him in our hearts to wherever He wants to go, and there are many places to which He may never go unless we take Him there. How will Honduras ever find healing and peace if the doctors and peacemakers flee? Where will they find hope if the ministers of the Gospel run away, essentially saying there is none? How will they learn about sacrificial love when those who are supposed to be models of it aren’t willing to make sacrifices? Fr. Ruperto, the Director of Vocations, asked me if I wanted to teach again next year and I didn’t hesitate in saying yes. Truly, this was one of the best discernment processes I’ve ever had. Father had mentioned the possibility of two years last January, so I had a whole year to think about it and get to know the seminarians. When the time came to actually make the decision, it was easy and joy-filled. It also answers a few of my questions about the next steps in life too. It means I’ll be extending my stay here for a few months, and that I won’t have to start looking for teaching jobs next spring. Past next November, I have no idea what life will look like, but it’s comforting that I’ve sort of got a plan until then. Please keep me in your prayers… they’re definitely needed. No matter how hard the way, it will in some measure be sweet to us, and we shall take it, not as a path along which we are driven, but as one whose attraction we cannot resist, because we know that on it we shall someday discover Him. With faith and courage and limitless love. It’s what’s written above the oracle at Delphi and it was the theme of my high school government class. That maybe sounds odd at first, but it makes more sense once after thinking about it a bit. After all, if government is the study of men coming together as social units… one would hope to know something about man. What always followed the “know thyself” bit was that man is mortal. As I noted a few weeks ago, I’ve learned a lot here in Honduras about both myself and humanity as a whole. In particular, being down here has very much confirmed the whole “man is mortal” bit. In these past twelve days alone we experienced three more deaths. Not people close to the community, but rather loved ones of others who are close to the community. After all this time, it still hasn’t gotten any easier to see people you care about in pain. Then, too, we constantly have to take safety precautions. Being careful with the water, putting on bug spray (two of the friars came down with dengue this week), not walking alone, and safety, insofar as it’s possible, in transportation. SIDESTORY. Haha, I actually had a pretty crazy adventure Monday coming back in a bus from San Luis where we had been putting on a leadership retreat for teenagers. There was definitely a moment where I thought, “Hmm… well, I guess if I’m meant to die on this school bus sliding backwards in the mud on this mountain road, then that’s how it’ll happen.” Obviously (and thankfully) I did not and helpfully, a giant tractor thing happen to be going by to get us up the mountain. Anyways. I promise it’s not nearly as scary is it all may sound. I never wake up or go to bed in fear that I might day the next day. But it does offer a very important perspective. Being down here, I’ve seen that… well, yes, we’re going to die, but more than that. We were made to be saints. But. Like actually. Saints. Not just saying that because the Baltimore Catechism tells me so. One of the formation talks we received this summer noted how there’s a huge danger with placing saints in this super hero category. It makes sainthood something unattainable for the rest of us normal people. Not true. And not healthy. I suppose I’ve been thinking more about it than lately because, one, I’ve been reading all these fantastic books like The Practice of the Presence of God and Everday Sanctity (okay, this is a little blue book that I found on our shelf. By MA Nailis. It doesn’t have an Amazon page, but if you find it, read it! It’s excellent! ), and too, because that was the topic of my talk at said retreat in San Luis… “The Road to Sanctity.” Long story short, I think I’ve come to two (perhaps obvious) conclusions. One. The technical definition of a saint is someone in heaven… aka, someone in the presence of God. I think those saints who are most famous on earth, those like Mother Teresa and Saint Francis… or even the saints who are not so famous, like my Uncle Steve, who I’m quite confident is in heaven, what they had in common was that they actually lived the reality that God is present with us here on earth too. How differently would I act if I took into account every moment that He’s here… with me… right NOW? And MOREOVER, He’s present in my neighbor and in a particularly special way the poor. So my new goal is to make myself more aware of God’s presence in the little things. Like now, when I walk by the chapel, I’m trying to get in the habit of doing a full genuflection and sign of the cross, rather than the sort of knee goes halfway down and the sign of the cross that (ha, as my stepdad has said ) looks more like you’re swatting a fly as I run back and forth between the kitchen and the library. Two. “Yes” to the Duty of the Moment. Which is something I talk about all the time… but again, this whole realization that really any day could be my last has given me new perspective. So often I think we get discouraged when we think about life in terms of the next 70 years. Ohmygosh, if I was going to be a saint, that would mean I’d have to be nice to my younger brother for the rest of my life. COMPLETELY impossible. Or never complain or gossip or whatever sin/human weakness you care to name ever again… clearly not going to happen. Or we get into this mindset of Saint Augustine, “Make me a saint, Lord, but not yet!” Let me just enjoy today and then tomorrow I’ll start improving my prayer life, loving my neighbor, etc. etc. So. My new attitude– I don’t have to be nice to my brother for the rest of my life or never gossip again. God isn’t asking me to do that. He’s asking me to do that just once. Be nice to my brother right now. In this moment. I only have to say “yes” one time. Furthermore, as He’s right here and present with me, He’ll give me the strength to do it. Does this make sense? Maybe it sounds weird… but it’s given me a lot of hope as I think about the future… because sometimes thinking about the future scares me and/or makes me tired. But… again, when the saints where doing all their crazy works… hmm… how to describe it. For example, I think about the life of Mother Teresa and it scares me out of my wits. I could NEVER be a saint like she was. But really, all she did was just give God one yes at a time, until she wound up at heaven’s doorstep. And that’s what He’s asking of me too… not that I be Mother Teresa, but that I give Him one “yes” at a time, until I wind up… well, hopefully at heaven too. And thus concludes this week’s reflection. I spent all of Wednesday morning making this giant construction paper mural with Leydi for the girls at Casa Misericordia. It’s an ocean/jungle thing… eventually it’ll have all their names and birthdays. It was a blast. Times like those are when I pause to wonder if my life is really this awesome. Ha, other moments of pure terror from the week: I was eating an orange at lunch when in the last little piece, I saw worms. Gross, nasty little white worms with these little black pinpoint eyes. I almost died right then and am still recovering from the trama. I washed all my jeans this morning! And it hasn’t rained today, so they’ve had time to dry! This is a HUGE victory. I had spiritual direction with a Poor Clare on Tuesday. Ah-mazing. Possibly life changing. We’ll wait and see. But no. I don’t have plans to become a Poor Clare in case you were wondering. The friars in their incredible goodness and generosity gave us a giant block of chedder cheese aka a giant block of GOLD. And no, I am not speaking in hyperbole. This is serious. I think we’re going to play soccer at the girls’ orphanage tomorrow… I probably won’t tell you all the embarrassing details in the next blogpost. Speaking of! There probably won’t be another blogpost for a while. Next weekend we’ve got Pan de Vida retreat in Ceiba, the weekend after that, I’m going to Santa Elena for a followup mission, weekend after that it’s San Luis for the final leadership retreat (advent/Christmas themed! ), and thennn, probably something with Becas (scholarship kids) the weekend after that, then we’re going to Trujillo to celebrate thanksgiving with the super awesome folks at Farm of the Child, then it’s our training week for Honduran teenagers, then our week of mission for Honduran teenagers, and then I’m HOME FOR CHRISTMAS! Dude. 2014. Where did you go? So yeah, if you don’t hear from me for a bit, all of the above is probably why. Last but not least, I’ve decided I want to start adding prayer intentions at the bottom of every post… something that hopefully allows everyone back home to stay a little more connected to life down here. For Mario, Gary, and Ada, that their souls might rest in peace, and then for their families that they might be comforted. For the Pan de Vida retreat next weekend. For Mariana, a woman who came to our door yesterday in need… actually for the soul her father too, who died yesterday. For the Missioners’ community as we elect a new servant leader and new directors this weekend. For our car that it can be fixed and stay fixed and that it all isn’t too expensive. For our Becas kids as they start finishing the school year. For the seminarians here in Comayagua, for their faithfulness, and an increase of seminarians and religious in general.